The Dancer was one of seven works that Renoir included in the first exhibition of the Société anonyme coopérative des artistes, peintres, sculpteurs, graveurs, etc., which opened in April 1874. In contrast to works by most of the other artists in the group—soon to be dubbed the impressionists—Renoir's paintings were relatively well received. The Dancer in particular was singled out for attention. While some dismissed it as being little more than a sketch and lacking in good draftsmanship (the same criticisms leveled at many of the works on display), others found it graceful and charming, praising its realism and originality of conception. As one writer remarked, "The Danseuse is true to life and has a fine and nervous elegance in its truth." Another admired the dancer's head, which he described as "fresh, alive, with a very simple modeling and a very accurate bearing." The Dancer inevitably calls to mind the work of Renoir's fellow impressionist Edgar Degas, whose name is now synonymous with depictions of ballet dancers. In contrast to Degas, whose interest lay in depicting dancers in repose, captured in unguarded and unselfconscious moments, Renoir chose to paint a more formal portrait. Both the painting's scale and the figure's prominence (placed in the very center of the composition, she dominates the entire canvas) hark back to traditional portraits, lending this work a gravity somewhat at odds with the painting's modern subject. Shown in profile, her silk-slippered feet placed in classic fifth position, Renoir's dancer is poised and alert as she turns her gaze toward the viewer. Renoir accentuated the dancer's youth, highlighting the roundness of her face, the still boyish flatness of her chest, even the way the fingers of her left hand appear to toy nervously with tulle of her skirt. Although Renoir himself never identified the figure, the model is almost certainly Henriette Henriot, the young actress who posed regularly for the artist in the mid-1870s and whose likeness was featured in La Parisienne (National Museum of Wales, Cardiff), another large-scale painting shown by Renoir in the 1874 exhibition. Renoir skillfully transformed his model's appearance, depicting her with equal verve as both a sweet-faced adolescent on the verge of adulthood and a fashionable performer. Ultimately, however, Renoir's virtuoso brushwork is the painting's most compelling feature. His paint handling is varied, ranging from the delicate brushstrokes that define the dancer's face to the loose, almost careless application of paint in the picture's background. 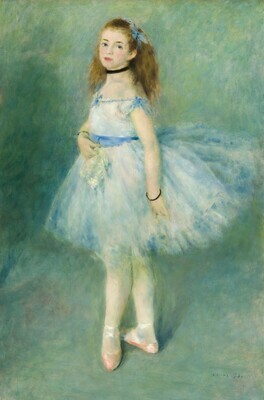 The dancer's skirt is a true tour de force; Renoir masterfully captured the gauzy softness of the tulle. It floats about her body like a cloud, seeming to dissolve into the hazy background, the fabric as light and insubstantial as mist. Four years after appearing in this historic exhibition, The Dancer was purchased by Charles-Henri Deudon, who amassed a small but important collection of impressionist paintings. In addition to this work, Deudon would go on to acquire five more paintings by Renoir as well as Manet's Plum Brandy. lower right: A. Renoir. 74. (Durand-Ruel et Cie, Paris); sold 17 May 1878 to Charles Deudon [1832-1914], Paris and Nice; his cousin Eugène Deudon [1841-1916]; sold 8 March 1899 to Paul Durand-Ruel [1831-1922, in his private collection], Paris; his family; inheritance from Estate of Peter A.B. Widener by gift through power of appointment of Joseph E. Widener, Elkins Park, after purchase by funds of the Estate, by 1925; gift 1942 to NGA. The early provenance according the Anne Distel, "Charles Deudon (1832-1914): collectionneur." La Revue de l'Art no. 86, 1989, p. 64. "Etats-Unis. Musées et collections," La Revue de l'Art XLVII, no. 266 (May 1925): 157. Première Exposition, Société Anonyme des Artistes Peintres, Sculptuers, Graveurs, etc. [First Impressionist Exhibition], Paris, 1874, no. 141. Exposition des oeuvres de P.A. Renoir, Durand-Ruel, Paris, 1883, no. 36. Exposition de tableaux de Monet, Pissarro, Renoir & Sisley, Galeries Durand-Ruel, Paris, 1899, no. 73. Exposition universelle, Paris, 1900, no. 561. XVIth Exhibition, Vienna Succession, 1903, no. 48. Pictures by Boudin, Cézanne, Degas, Manet, Monet, Morisot, Pissarro, Renoir, Sisley, Grafton Galleries, London, 1905, no. 240, as The Ballet Girl. Art Français, Grosvenor House, London, 1914, no. 67. Renoir, Galeries Durand-Ruel, Paris, 1920, no. 25. Exhibition of French Art 1200-1900, Royal Academy of Arts, London, 1932, no. 406. Exposition Renoir 1841-1919, Musée de l'Orangerie, Paris, 1933, no. 17a. Renoir. A Special Exhibition of His Paintings, The Metropolitan Museum of Art, New York, 1937, no. 5, repro. Seven Centuries of Painting. A Loan Exhibition of Old and Modern Masters, California Palace of the Legion of Honor and The M.H. de Young Memorial Museum, San Francisco, 1939-1940, no. Y-138, repro. (shown at he de Young Memorial Museum). Renoir Centennial Loan Exhibition 1841-1941 for the Benefit of the Free French Relief Committee, Duveen Galleries, New York, 1941, no. 7, repro. Diamond Jubilee Exhibition: Masterpieces of Painting, Philadelphia Museum of Art, 1950-1951, no. 76, repro. Manet and Modern Paris, National Gallery of Art, Washington, D.C., 1982-1983, no. 35, repro. The New Painting: Impressionism 1874-1886, National Gallery of Art, Washington, and The Fine Arts Museums of San Francisco, 1986, no. 17, repro. Loan for display with permanent collection, Museum of Art, Rhode Island School of Design, Providence, 1987. Paris in 1874: The Year of Impressionism, National Museum of Western Art, Tokyo, 1994, no. 42, repro. Impressionist and Post-Impressionist Masterpieces from the National Gallery of Art, The Museum of Fine Arts, Houston; The National Art Center, Tokyo; Kyoto Municipal Museum of Art, 2011, no. 40, repro. Renoir, Impressionism, and Full-Length Painting, The Frick Collection, New York, 2012, unnumbered catalogue, repro. Burty, Philippe. "Exposition de la société anonyme des artistes." La Republique française (25 April 1874): 2 [transcribed in Berson, Ruth, ed. The New Painting: Impressionism 1874-1886: documentation. 2 vols. San Francisco, 1996: I:36-38]. Chesneau, Ernest. "A côte du Salon: II: Le Plein Air: Exposition du boulevard des Capucines." Paris-Journal (7 May 1874): 2 and Le Soir (7 May 1874): 3 [transcribed in Berson, Ruth, ed. The New Painting: Impressionism 1874-1886: documentation. 2 vols. San Francisco, 1996: I:17-19]. Chesneau, Ernest. "Au Salon: Avertissement préalable." Paris Journal (9 May 1874):2 and Le Soir (9 May 1874):3 [transcribed in Berson, Ruth, ed. The New Painting: Impressionism 1874-1886: documentation. 2 vols. San Francisco, 1996: I:19-20]. de Lora, Léon. "Petites Nouvelles artistiques: Exposition libre des peintres." Le Gaulois (18 April 1874):3 [transcribed in Berson, Ruth, ed. The New Painting: Impressionism 1874-1886: documentation. 2 vols. San Francisco, 1996: I:26-28]. de Malte, C. "Exposition de la société anonyme des artistes peintres, sculpteurs, graveurs et lithographes." Paris à l'eau-forte (19 April 1874): 12-13 [transcribed in Berson, Ruth, ed. The New Painting: Impressionism 1874-1886: documentation. 2 vols. San Francisco, 1996: I:27-28]. de Montifaud, Marc. "Exposition du boulevard des Capucines." L'Artiste (1 May 1874): 307-313 [transcribed in Berson, Ruth, ed. The New Painting: Impressionism 1874-1886: documentation. 2 vols. San Francisco, 1996: I:28-29]. E.C. "Chronique: Beaux-Arts Expositions de peintures modernes." Revue de France 10 (April 1874):254-255 [transcribed in Berson, Ruth, ed. The New Painting: Impressionism 1874-1886: documentation. 2 vols. San Francisco, 1996: I: 11]. Leroy, Louis. "L'Exposition des impressionnistes." Le Charivari (25 April 1874): 79-80 [transcribed in Berson, Ruth, ed. The New Painting: Impressionism 1874-1886: documentation. 2 vols. San Francisco, 1996: I:25-26]. Prouvaire, Jean. "L'Exposition du boulevard des Capucines." Le Rappel (20 April 1874): 3 [transcribed in Berson, Ruth, ed. The New Painting: Impressionism 1874-1886: documentation. 2 vols. San Francisco, 1996: I:34-36]. Silvestre, Armand. "Chronique des beaux-arts: Physiologie du refusé - L'Exposition des révoltés." L'Opinion nationale (22 April 1874): 2-3 [transcribed in Berson, Ruth, ed. The New Painting: Impressionism 1874-1886: documentation. 2 vols. San Francisco, 1996: I:39-40]. Heilbut, E. "Die Impressionistenausstellung der Wiener Secession." Kunst und Künstler I, no. v-vi (February-March 1903):180-182, repro. Mauclair, Camille. L'Impressionisme, son histoire, son esthétique, ses maîtres. Paris, 1904:repro. facing p. 140. Bénédite, Leonce. "Madame Charpentier and her Children, by Auguste Renoir." The Burlington Magazine. 12, no. 57 (December 1907): 130. Duret, Théodore. Manet and the French Impressionists. Translated by J.E. Crawford Flitch. London and Philadelphia, 1910:162. Meier-Graefe, Julius. Auguste Renoir. Munich, 1911:51, repro. Meier-Graefe, Julius. Renoir. Paris, 1912: p. 47 repro. Pach, Walter. "Pierre Auguste Renoir." Scribner's Magazine lI, no. 5 (May 1912):606, repro. Vollard, Ambroise. Tableaux, Pastels & Dessins de Pierre-Auguste Renoir. Paris, 1918: repro. 82. Duret, Théodore. Histoire des peintres impressionnistes: Pissarro, Claude Monet, Sisley, Renoir, Berthe Morisot, Cezanne, Guillaumin. 2nd ed. Paris, 1919:85, 90. Vollard, Ambroise. La vie & l'oeuvre de Pierre-August Renoir, Paris, 1919:63. Meier-Graefe, Julius. Auguste Renoir. 2nd ed. Munich, 1920: 44-46, repro. p. 47. Rivière, Georges. Renoir et ses Amis. Paris, 1921:18-20, 50, 60, repro. p. 19. Fosca, François. Renoir. Paris, 1923: 14, repro. Jamot, Paul. "Renoir (1841-1919)." Gazette des Beaux Arts series 5, vol. VIII, no. 741 (November 1923): 258,272-273, 274, repro. Cortissoz, Royal. Seven Paintings by Renoir. Paris and New York, 1924:9, repro. Duret, Théodore. Renoir. Paris, 192442, 62-63, repro. pl. 7. Fosca, François. Renoir. Translated by Hubert Wellington. London, 1924: 15, plate 1. Vollard, Ambroise Auguste Renoir. Berlin, 1924:56. Coquiot, Gustave. Renoir. Paris, 1925: 66, 225. Cortissoz, Royal. Personalities in Art. New York and London, 1925: 279, 281, 282, repro. Bourgeois, Stephan. The Adolph Lewisohn Collection of Modern French Paintings and Sculptures. New York, 1928:124. Cortissoz, Royal. "Auguste Renoir and the Cult for Beauty" International Studio (August 1928): 17, repro. p. 19. Stein, Leo. A. Renoir 24 Phototypies. Les Albums d'art Druet XIII. Paris, 1928: plate 11. Besson, George. Renoir. Paris, 1929:7. Meier-Graefe, Julius. Renoir. Leipzig, 1929: 65, repro. p. 74, no. 43. Cortissoz, Royal. The Painter's Craft. New York and London, 1930: 229-230, 233. Paintings in the Collection of Joseph Widener at Lynnewood Hall. Intro. by Wilhelm R. Valentiner. Elkins Park, Pennsylvania, 1931: 184, repro. Rosenberg, Jakob. "Die Ausstellungen der Nationen in London." Kunst und Kunstler 31 (January-February 1932): 11, repro. Wildenstein, Georges. "Paintings from America in the French Exhibition." The Fine Arts 18 (January 1932): 54, repro. Grappe, Georges. "Renoir." L'Art vivant 174 (July 1933):280. Guenne, J. "La religion de Renoir." L'Art vivant 174 (July 1933): repro. p. 277. Roger-Marx, Claude. Renoir. Paris, 1933:29, 125, repro. p. 41. Roger-Marx, Claude. "Unité de Renoir." L'Art vivant 174 (July 1933):291. Barnes, Albert C. and Violette de Mazia. The Art of Renoir. New York, 1935: 50n., 55-57, 58n., 59, 60n., 64, 116n., 153, 177, 193n. 200n., no. 32, repro. Comstock, Helen. "The Connoisseur in America: The Renoir Loan Exhibition." The Connoisseur 100, no. 433 (September 1937): 154. McBride, Henry. "The Renoirs in America: In Appreciation of the Metropolitan Museum's Exhibition," Art News 35, no. 31 (1 May 1937): 158, repro. Vollard, Ambroise. En écoutant Cézanne, Degas, Renoir. Paris, 1938: 176. Waldmann, Emil. "Die Sammlung Widener." Pantheon 22 (November 1938): 335. Venturi, Lionello. Les archives de l'impressionnisme. 2 vols. Paris and New York, 1939: I: 153, 289; II: 200, 256. Wilenski, R.H. Modern French Painters. New York, 1940: 33, 62, 161-162, 337, 370. "L'Exposition du Centénaire de Renoir a la Galerie Duveen." Voix de France (15 November 1941):5, repro. Whitehill, Virginia N. Stepping Stones in Nineteenth Century Painting. New York, 1941:32-33. Mather, Frank Jewett. "The Widener Collection at Washington." Magazine of Art 35 (October 1942): 195-203, repro. Drucker, Michel. Renoir. Paris, 1944:37, 41, 47, 131, 150, 183-185, 196, no. 24, reprol pl. 24. Wilenski, R.H. Modern French Painters. London, 1944: 33, 62, 161-162, 337, 370. Rewald, John. "Depressionist Days of the Impressionists." Art News 43 (1-14 February 1945): repro. Rewald, John, ed. Renoir Drawings. New York, 1946: 19, no. 27. Rewald, John. The History of Impressionism. New York, 1946: 256, repro. 257. Leclerc, André. Renoir. New York, 1948: repro. 35. Paintings and Sculpture from the Widener Collection. National Gallery of Art, Washington, 1948 (reprinted 1959): 109, repro. Zahar, Marcel. Renoir. London, 1948: viii, ix, xi no. 16, repro. Chamson, André. Renoir. Lausanne, 1949:13, 15. A Loan Exhibition of Renoir for the Benefit of the New York Infirmary. Exh. cat. Wildenstein, New York, 1950: 27. Pach, Walter. Pierre Auguste Renoir. New York, 1950:44, repro. Cairns, Huntington, and John Walker, eds., Great Paintings from the National Gallery of Art. New York, 1952: 164, color repro. Gaunt, William. Renoir. London, 1952: 6, 9, plate 12. Berr de Turique, Marcelle. Renoir. Paris, c. 1953: 6, 9, repro. plate 12. Rouart, Denis. Renoir. Geneva, 1954:30,34. Leymarie, Jean. Impressionisme. 2 vols. Geneva, 1955:II:72, repro. Rewald, John. Histoire de l'Impressionisme. Paris, 1955:205, 207. Bérard, Maurice. "Un Diplomate, ami de Renoir." Revue d'histoire diplomatique (July-September 1956): 240. National Gallery of Art. Paintings and Sculpture from the Widener Collection. Reprint. Washington, DC, 1959: 109, repro. Daulte, François. "Le marchand des Impressionistes." L'Oeil 66 (June 1960): 54-61, 75 repro. Feist, Peter H. Auguste Renoir. Leipzig, 1961:34, 62, no. 13, repro. Fosca, François. Renoir, His Life and Work. London, 1961:41, 46, 47. Gaunt, William. Renoir. Greenwich, CT, : 13, 16, repro. Renoir, Jean. Renoir, My Father-. Boston and Toronto, 1962:168. Gimpel, René. Journal d'un collectionneur, marchand de tableaux. Paris, 1963: 180. Walker, John. National Gallery of Art, Washington, D.C. New York, 1963 (reprinted 1964 in French, German, and Spanish): 324, repro. Cooke, H. Lester. Galeria Nacional de Washington. Translated by Maria Teresa de la Cruz. Madrid, 1965: 340, repro. Lambourne, Nigel. Renoir: paintings, drawings, lithographs and echings. London, 1965: repro. 8. Summary Catalogue of European Paintings and Sculpture. National Gallery of Art, Washington, 1965: 111. Gimpel, René. Diary of an Art Dealer. Translated by John Rosenberg. New York, 1966: 155. Feist, Peter H. Auguste Renoir. Leipzig, 1967: 33-34, 62, no. 13, repro. Walton, P.H. Renoir. New York, 1967:24, no. 21, repro. European Paintings and Sculpture, Illustrations. National Gallery of Art, Washington, 1968: 99, repro. Renior. Paris, Réalités Hachette, 1970: 123, 234, 250, repro. 111. Daulte, François. Auguste Renoir, catalogue raisonné de l'oeuvre peint. Vol.I: Figures 1860-1890. Lausanne, 1971: 26, 37, no. 110, repro. Daulte, François. August Renoir. Milan, 1971:26, 30, 86. Gaunt, William. Renoir. 2nd ed. London and New York:1971:9, 12, color repro pl. 11. Fezzi, Elda. L'opera completa di Renoir nel period impressionista. Milan, 1972: 83, 94, no. 126, plate 15. Rewald, John. The History of Impressionism. New York, 1973: 316, 318, 319, repro. Adhémar, H. and Gache, S. "L'Exposition de 1874 chez Nadar (rétrospective documentaire)." In Distel, Anne, et. al. Centenaire de l'Impresionnisme. Exh. cat.. Grand Palais, Paris, 1974: 257, 258, 259, 266, 269. Rewald, John. "Jours sombres de l'impressionnisme." L'Oeil no. 223 (February 1974): 18, repro. European Paintings: An Illustrated Summary Catalogue. National Gallery of Art, Washington, 1975: 292, repro. Wheldon, Keith. Renoir and his art. London and New York, 1975:63, repro. Benezit, Emmanuel. Dictionnaire critique et documentaire des peintres, sculpteurs, dessinaterus et graveurs de tour les temps et tous les pays. 10 vols. Paris, 1976: 8:691. Gaunt, William. Renoir. Oxford, 1976: repro. 15. De Poli, Franco. Renoir. Munich, 1978:92, repro. Kelder, Diane. The Great Book of French Impressionism. New York, 1980: 438, repro. Monneret, Sophie (intro). Guida alla pittura di Renoir. Milan, 1980: no.119. Stuckey, Charles F. "Degas as an Artist: Revised and Still Unfinished." In Guillard, Maurice, ed. Degas form and space. Paris, 1984: 33, repro. 32. Walker, John. National Gallery of Art, Washington. Rev. ed. New York, 1984: 462, no. 670, color repro. White, Barbara Ehrlich. Renoir: His Life, Art, and Letters. New York, 1984: 20-51, 64, 91, 230, repro. 53. Arts Council of Great Britain. Renoir. Exh. cat., Hayward Gallery , London, Galleries nationales du Grand Palais, Paris, and Museum of Fine Arts, Boston, 1985-1986: 196-197, repro. European Paintings: An Illustrated Catalogue. National Gallery of Art, Washington, 1985: 335, repro. Fezzi, Elda. L'opera complete di Renoir nel period impressionista 1869-1883. Paris, 1985:no.121, repro. Bernard, Bruce. The Impressionist Revolution. London, 1986:64, repro. Distel, Anne. "Charles Deudon (1832-1914): collectionneur." Revue de l'Art no. 86 (1989):64, repro. Distel, Anne. Les collectionneurs des impressionnistes. Amateurs et marchands. Paris, 1989:157, repro. Buisson, Sylvie. Danse et Danseurs en peinture. Paris, 1991:128, repro. Coman, Florence E. Joie de vivre: French Paintings from the National Gallery of Art. Washington, 1991: no. 1, repro. Adriani, Götz. Renoir. Exh. cat., Kunsthalle Tübingen, 1996: 116, repro. Berson, Ruth, ed. The New Painting: Impressionism 1874-1886 -- Documentation. 2 vols. San Francisco, 1996: 1:11, 14, 18-19, 23, 25, 27, 29, 34, 37, 40; 2:12, repro. Roos, Jane Mayo. Early Impressionism and the French State (1866-1874). Cambridge, 1996: 208, fig. 151. Sagner-Düchting, Karin. Renoir: Paris and the Belle Epoque. Munich, 1996:78, repro. 79. Bailey, Colin B. Renoir's Portraits: Impressions of an age.Yale University Press New Haven and London, in association with National Gallery of Canada Ottawa, 1997: 17, 25, 31, 314 n.8. Kelder, Diane. The Great Book of French Impressionism, 1997, no. 216, repro. The Courtauld Collection: Masterpieces of Impressionism and Post-Impressionism, Exh. cat., Art Gallery of Ontario, 1998: 68, repro. Tucker, Paul Hayes. "Renoir in the 1870s and '80s: Modernity, Tradition, and Individuality. In Renoir from outsider to old master, 1870-1892. Exh. cat., Tokyo, 2001: 219, repro. Lilley, Ed. “A Rediscovered English Review of the 1874 Impressionist Exhibition.” Burlington Magazine 154, no. 1317 (December 2012): 844, 845, color fig. 26.